Today was the last day of programs during the tour. For the grand finale, the schedule was again packed. We had a whole day program at the Cairo university. Meanwhile, there was the last inner peace workshop at Darb 1718 gallery, followed by a concert at the Swiss club. Nichola, Isa, Anand and Tara went for the workshop at the Darb 1718. Three young men traveled all the way from Alexandria to come to our workshop today. Besides few stayed back to recover from the exhaustion. The rest of us all went to the Cairo university program. 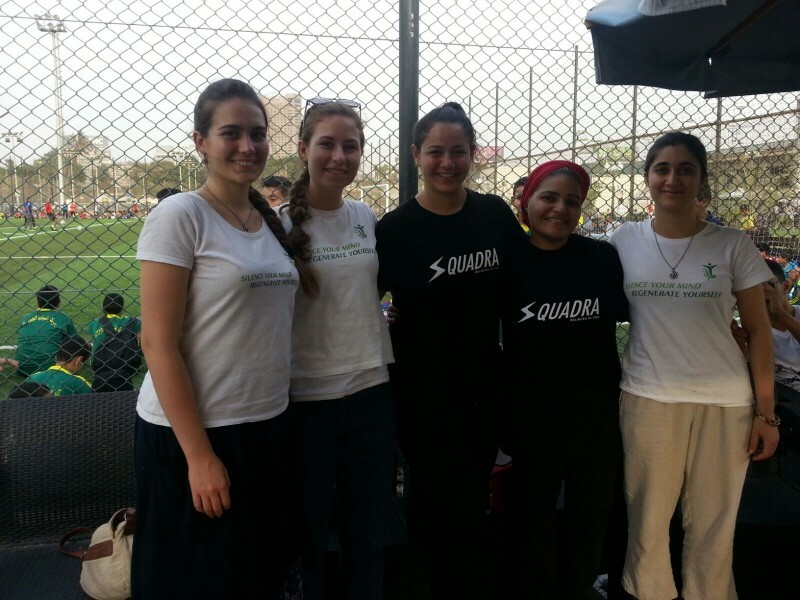 The program was the collaboration with Squadra, the fitness group. Components of the program included football, fitness and meditation. It was remarkable to see the youth playing football under the mid-day scorching sun in Egypt. Our team set up a stand in the shaded area by the field, and was able to introduce meditation to about 80 youths throughout the day. Later in the afternoon, most of us travel to Swiss club for our last concert. We were fortunate to have a professional sounding system team, and the setup was pain-free. However, the heat prevented people from coming. Still, we decided to give our best performance to the few people that came. While waiting for the audience, our musicians started to play and improvise freely. Gradually, people started to gather in the hall, for us to start the concert, in which we gave out our best. The space was filled up with sheer joy, beauty, and oneness- a unique experience all of us created and enjoyed. After the concert, we got together to celebrate at the Abo Elseed restaurant with Egyptian cuisines. This day ended with the de-installation of the artwork at the Darb 1718 gallery, marking the completion of the 10-day art exhibition for inner peace. We parted with our friends at the Darb village in the quiet warm summer night. “All’s well that ends well.” the line by Shakespeare came to my mind, as it concluded the first chapter of our work in Egypt. Isa interviews Ashraf and Stavros who have traveled from Alexandria to Cairo for one of our workshops.